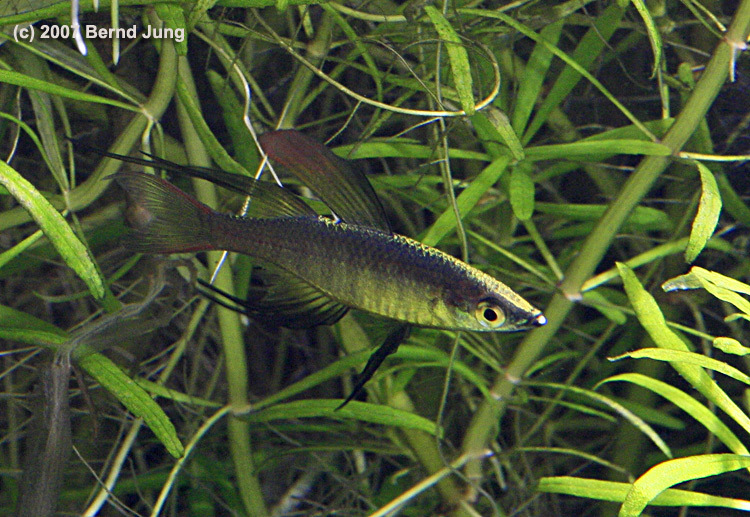 I've created this online diary because I want to breed Iriatherina werneri (Threadfin rainbowfish) and I couldn't find enough information how to breed them efficient in European climate. 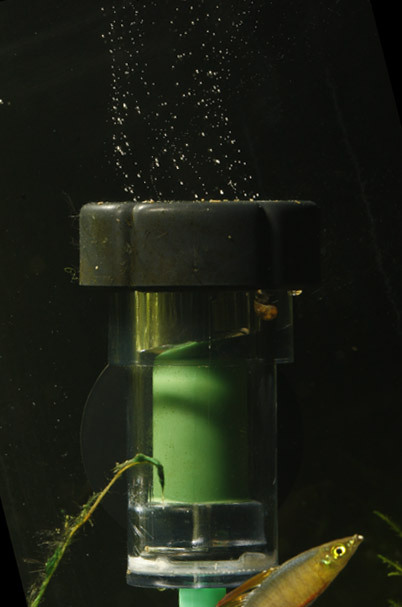 The biggest problem by raising fry is to offer them the "right food" within the first days. Due to our cold climate it's not possible to breed them in ponds without heating the ponds except 1 or 2 months a year. Even the adult I. werneri's mouth is so small and their throat is so narrow that they can eat only crushed flake food. Newly hatched brine shrimp is a perfect food for them, also other small live food. So the problem that occurs with I. werneri fry is that newly hatched brine shrimp are to big for them. Several people told me that you will see a difference in raising them with tiny live food (plancton, infusoria, etc...) and feeding micro flakes. You see, the problem is feeding them right the first days ! 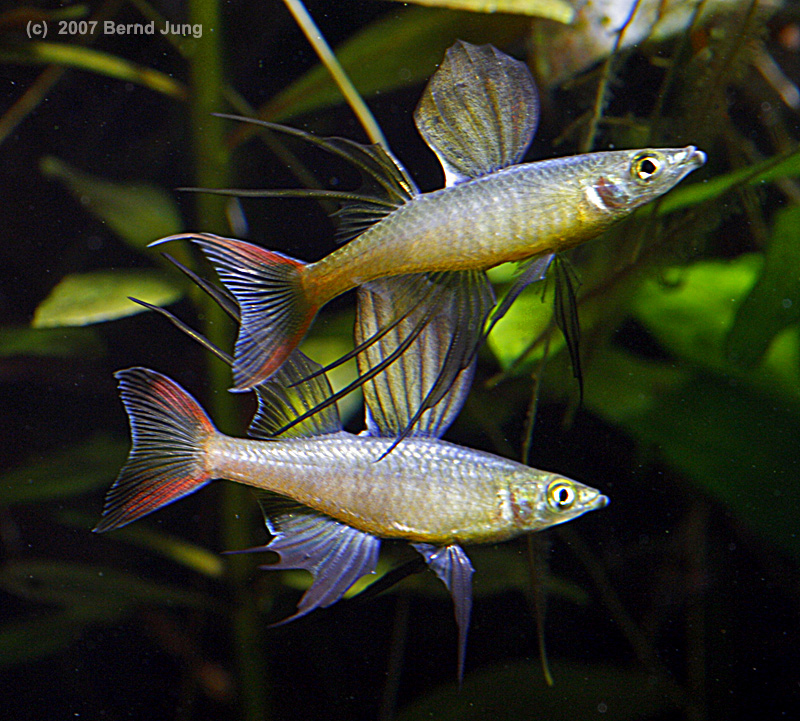 So far my breeders lived in a heavily planted 240 L tank together with Melanotaenia Praecox and Pseudomugil signifer. I'm keeping 6 male and 7 female I. werneri. Dennerle BIO CO2 with diffusor "micro perler"
I will try 3 different methods of breeding I. werneri. One is only possible during German summer, the others 12 months a year. I will definitely not leave the adults with the fry in the same tank because I know that they will eat their fry in a tank of that size. I will setup a small 150 L outdoor pond with some plants in pots. Because of our cold climate I will use a heater especially for the night. When the I. werneri lay eggs in the moss, I will move the moss to the tub. Hopefully there will be enough plancton for them to grow up and survive the first days. I'll feed them with newly hatched brine shrimp when they're big enough. When they lay eggs on the moss, I will move the moss to a 25 L tank and feed them with infusoria. Hopefully I will succeed in letting a culture grow for some weeks....fingers crossed! This is the last method that I will try. 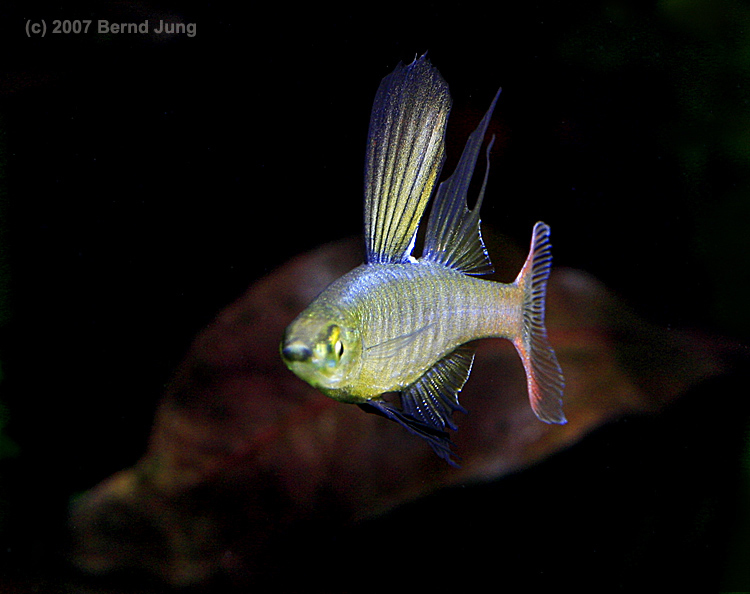 When the I werneri lay eggs, I will put the adults back into the show tank and try to raise fry in the 54 L breeding tank feeding them with Sera micron and JBL NobilFluid. I could imagine a fourth method but I'm not sure if that will be possible for me. If I established a second tub I could keep the breeders in the tub and use mobs. The breeders could stay in the tub and I change only the mobs to put the eggs into a 2nd tub. I've no idea if I will do this but I think it might work.